Recently, during an hour long interview with Pope Francis on Italian television, he was asked about a new French translation of the Lord’s Prayer for use in the liturgy. Basically, the Church in France had changed the line that in English reads “and lead us not into temptation” to one that means “do not let us fall into temptation.” Commenting on the change, the Pope said, “It's me who falls. It's not Him who pushes me into temptation, as if I fell. A father doesn't do that. A father helps you to get up right away. 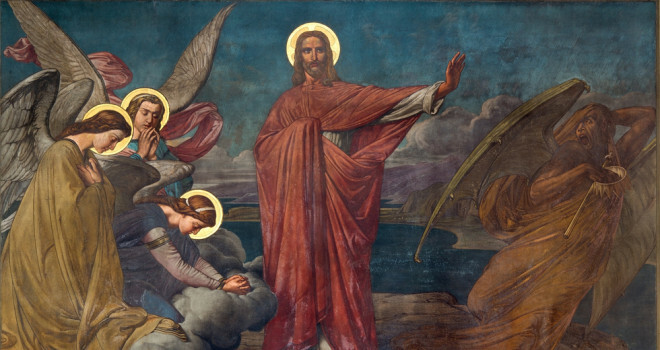 The one who leads into temptation is Satan.” That’s true and St James would agree with him, “When tempted, no one should say, 'God is tempting me.' For God cannot be tempted by evil, nor does He tempt anyone; but each one is tempted when, by his own evil desire, he is dragged away and enticed.” But all three Synoptic gospels also indicate that Jesus was “driven” or “led by the Spirit” into the wilderness in order to be tempted by the devil. What do we make of this? Unlike St Matthew and St Luke, which speaks of Jesus being led into the wilderness by the Holy Spirit, St Mark the Evangelist uses a much stronger Greek verb, “ekballo,” translated as “drove” in our English text. The word suggests violent expulsion. This same word is used 17 times in the gospel of St Mark. It is used 11 times for casting out demons. It is used for “tearing out one’s eye and throwing it away” (9:47), and used in the cleansing of the temple when Jesus drove out the merchants in the temple (11:15), and when the evil tenants threw the heir out of the vineyard (12:8). It is as though the Holy Spirit grabbed Jesus by the scruff of His neck and threw Him into this strange encounter. The Holy One of God who alone can drive out Satan and his minions, is Himself, driven out, literally ‘exorcised’ by none other than the Holy Spirit. Certainly Jesus was no reluctant participant. He was no mere puppet of the Holy Spirit. The juxtaposition of the work of the Spirit and that of Satan is both intentional and ironic. These temptations didn’t just happen by accident. Our Lord did not just happened to be in the desert by chance. It was the Holy Spirit himself who propelled Jesus into the wilderness. This was God’s doing. There is something deliberate here. If that seems scandalous and disturbing, that is, the thought that God who had found favour with His Son, would lead Him down this path of being tempted, it would be good but still not comforting to know that confrontation with evil is an essential part of the Son’s mission. Why would God do this? Perhaps God wants His Son to take the offensive against temptation, and not just be on the defence. Our Lord, the Anointed One of God is being sent to be God’s challenger of evil, as was Job. But God is not sending His Son into the lion’s den without any aid. The movement and presence of the Spirit reassures the Lord that He is not alone in facing this trial and all the future trials He must experience in order to complete His mission. The Holy Spirit is with Him to help Him resist the temptations. It is also important to note that though the Holy Spirit drove Our Lord into the wilderness, He did not lead Him into temptation. The Holy Spirit does not do the testing. He leaves that to another. The evangelist also seeks to draw a profound parallel between the present and the past, thus highlighting the significance and effects of Christ’s mission. Genesis 3:24 in the Septuagint (The Greek version of the Old Testament) reads, God “drove out the man from the Garden of Eden” into wilderness. They were cast out. We now see the beginnings of the grand reversal. In the gospel scene, the Spirit “drove” or cast Jesus into the wilderness to face the temptations wherein Adam and Eve failed, to begin the journey of turning the wilderness into a garden again. By facing and overcoming these temptations, our Lord is regaining Paradise lost. But our comparison with the Eden and the First Adam is not done. The “wild beasts” occur only in St Mark’s version of the story of temptation. Some scholars see in this an allusion to the sufferings the early Christians had to endure. Just like the early Christian martyrs who were being thrown into the Roman amphitheatres to be killed by ferocious wild beast, Our Lord shares their predicament. But here there is a difference, the angels accompany Him as they will accompany the Christian martyrs even in this final moment of testing. But there is another and perhaps preferable explanation – it is Jesus the Second Adam taking His place as the Lord over His creation. Adam sinned and nature was cursed. The garden was exchanged for a wilderness. In Jesus the restoration has begun with the animals of the wilderness being part of the new Eden. Mark’s text reads, Jesus was “with” the wild animals. This is the language of intimacy. The original harmony of creation, injured and marred by the Fall, is now being restored. So God does not do the tempting – He does not push us to make us fall nor does He put evil desires in our hearts. But He does bring us into the presence of many tests and temptations. In fact, every step we take is a step into the presence of temptation. There is no moment of your life that is not a moment of temptation, and we should not labour under the illusion that we will not be tempted. That’s a given. In fact, that’s what life is: endless choices between belief and unbelief, pride and humility, obedience and disobedience, selfishness and generosity. Temptation is a test of a person’s ability to choose good (virtue) instead of evil (vice or sin). Such moments of testing purifies and there is growth in virtue when we choose, by the grace of God, not to yield to them. Lent is upon us. This is the time when we train to battle with the perennial wilderness, the Devil and the temptations he throws at us at every turn. Adam was expelled from the earthly paradise, the symbol of communion with God. Now, in order to return to that communion and thus to eternal life we must pass through the wilderness not just of Lent but of life. We must pass through the test of faith. Not alone but with Jesus who proceeds, not just with us but ahead of us, and who has already conquered in the fight against the spirit of evil. This liturgical time invites us to renew our decision to follow Christ on the path of humility in order to participate in His victory over sin and death. In Him we now live our lives. Let us welcome Lent by embracing its way of voluntary sacrifice, of fasting, prayer and almsgiving. In so doing, we will receive the much needed grace it offers and be made ready to celebrate in greater freedom the Victory Feast of the Resurrection.